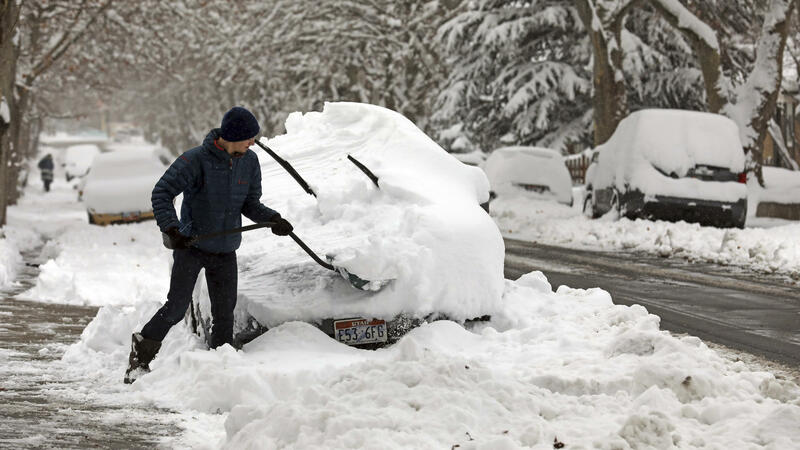 Landon Ainge digs his car out of the snow on Wednesday in Salt Lake City, where a heavy snowfall triggered a rare snow day for many students. "A pretty strong mid- and upper-level trough" is responsible for the system that brought significant snowfall to the West this week, Marc Chenard, meteorologist at the Weather Prediction Center, told NPR. He added that a large area is seeing "some type of wintry impact." Las Vegas saw snowfall on Tuesday as well as something even more exotic: graupel. The National Weather Service says the term applies to snowflakes that "collect supercooled water droplets on the outer surface," similar to small hail. Several inches of snow fell over parts of the Pacific Northwest, keeping students at home in Portland, Ore., Tuesday. Seattle's public schools were closed on Monday, Tuesday and part of Wednesday. Law enforcement joined in the snow day action outside Seattle. Police in Duvall, Wash., had fun with a video about "a group of suspicious characters in a local park," actually a bunch of kids with snowballs. Police engaged them in a snowball fight, but their riot shield proved no match to the kids' barrage and it ended with the police shouting "tactical retreat" and conceding defeat. School districts across Utah canceled classes Wednesday amid several inches of snow. The Salt Lake Tribune reports it was the first time in some two decades that school was called off in Salt Lake County. By early Tuesday evening, Utah Highway Patrol reported around 100 crashes across the state. A Rich County deputy was investigating one of the crashes at a truck ramp earlier in the day when a semi coming down the grade lost control and struck him. The deputy suffered serious, but not life-threatening, injuries, according to the Utah Department of Public Safety. The tractor-trailer driver suffered minor injuries. Citing the risk of avalanches, the Utah Department of Transportation shut down Little Cottonwood Canyon, restricting access to Alta and Snowbird ski resorts. "There are so many people who want to take advantage of the fresh powder," John Gleason, UDOT spokesman, told the Tribune. "We have to choose safety over convenience." Back in California, a few flakes were spotted falling in San Francisco, a rarity, with more snow accumulating in the surrounding higher elevations. Farther inland, several feet of snow fell in the Sierra Nevada. Mammoth Mountain reported accumulations of 10 feet, and nearby June Mountain temporarily shut down operations. At California's Yosemite National Park all roads were closed Tuesday into Wednesday. Park officials urged the visitors already there to remain indoors "to avoid falling trees." By the time the system moves into the East as of Thursday night, Chenard says, warmer air means it will turn mostly to rain.